Anna Bolton | Greene County News Greene County Children Services staff plant 1,000 blue pinwheels in front of its offices on Ledbetter Road on a snowy April 2. 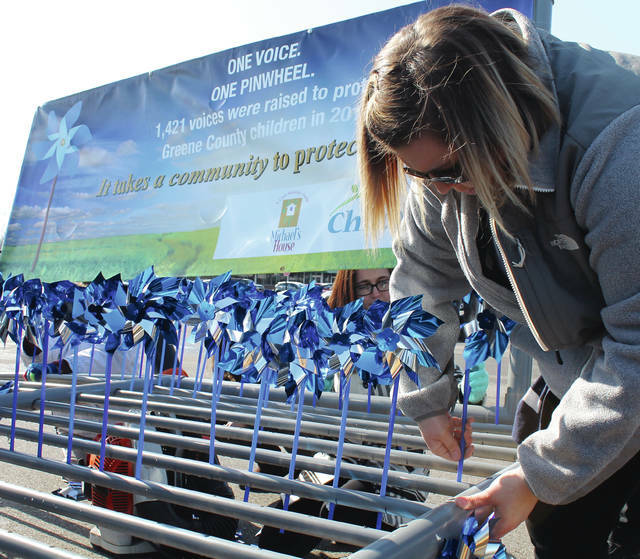 The planting of the pinwheels marks the beginning of National Child Abuse Prevention Month with each pinwheel representing a voice — 1,421 to be exact — that spoke out in concern for the safety of Greene County children in 2017. Staff members plant the pinwheels in a base constructed by Greene County Parks & Trails crew members. Allen Beam, GCP&T Maintenance Division, demonstrates to children services’ staff members how to insert the pinwheels into the newly-constructed base. Greene County Children Services staff plant 1,000 blue pinwheels in front of its offices on Ledbetter Road on a snowy April 2. 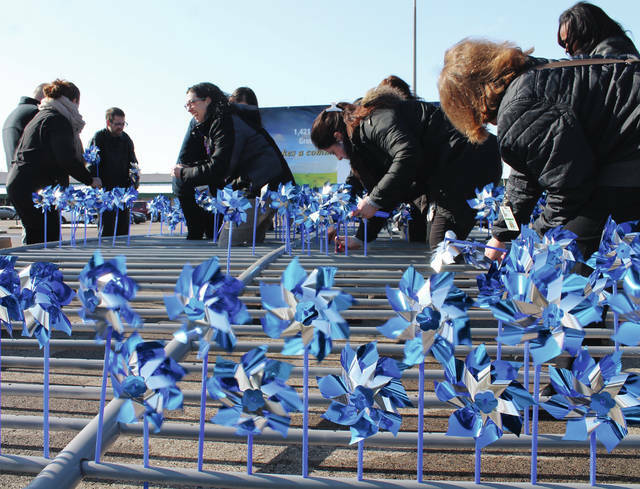 The planting of the pinwheels marks the beginning of National Child Abuse Prevention Month with each pinwheel representing a voice — 1,421 to be exact — that spoke out in concern for the safety of Greene County children in 2017.
https://www.fairborndailyherald.com/wp-content/uploads/sites/50/2018/04/web1_PinwheelsSign.jpgAnna Bolton | Greene County News Greene County Children Services staff plant 1,000 blue pinwheels in front of its offices on Ledbetter Road on a snowy April 2. 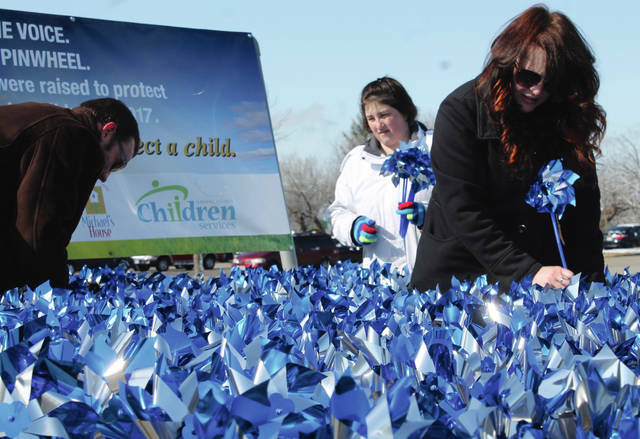 The planting of the pinwheels marks the beginning of National Child Abuse Prevention Month with each pinwheel representing a voice — 1,421 to be exact — that spoke out in concern for the safety of Greene County children in 2017.
https://www.fairborndailyherald.com/wp-content/uploads/sites/50/2018/04/web1_PinwheelsLandscape.jpgStaff members plant the pinwheels in a base constructed by Greene County Parks & Trails crew members. 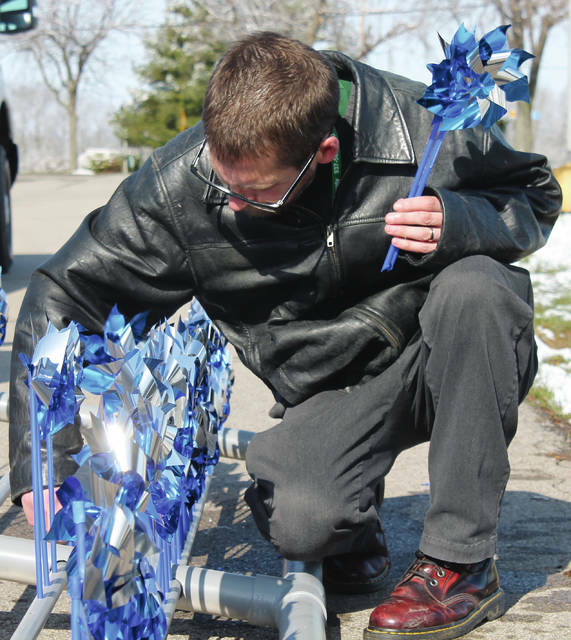 https://www.fairborndailyherald.com/wp-content/uploads/sites/50/2018/04/web1_PinwheelsMan.jpgStaff members plant the pinwheels in a base constructed by Greene County Parks & Trails crew members. 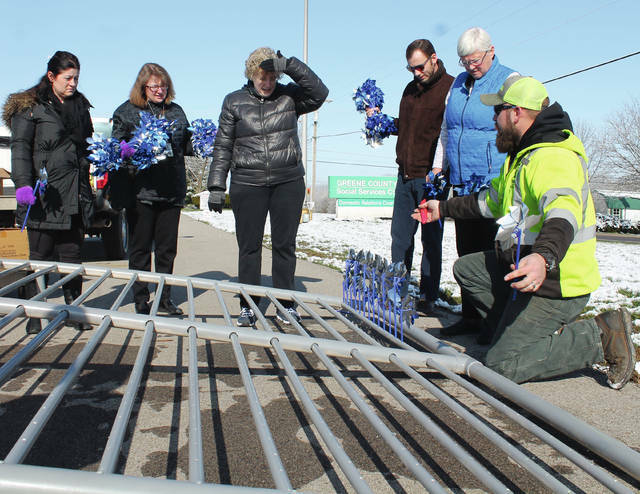 https://www.fairborndailyherald.com/wp-content/uploads/sites/50/2018/04/web1_PinwheelsWoman.jpgStaff members plant the pinwheels in a base constructed by Greene County Parks & Trails crew members. https://www.fairborndailyherald.com/wp-content/uploads/sites/50/2018/04/web1_PinwheelsParks.jpgAllen Beam, GCP&T Maintenance Division, demonstrates to children services’ staff members how to insert the pinwheels into the newly-constructed base.